(“The Lisbon Traviata” plays at the New Conservatory Theatre Center from February 22 through March 24, 2013). Terrence McNally is certainly one of America’s premiere gay playwrights, and it is no surprise that the New Conservatory Theatre Center has made something of a specialty of his plays. As one would expect, their current staging of “The Lisbon Traviata” is intelligent, straightforward and effective. Opera Queens Stephen and Mendy discuss records and love.L to R: Michael Sally (Mendy) and Matt Weimer (Stephen). Opera represents a world of heightened emotions, and is famously appealing to gay men, perhaps because for so long so many gay men have felt compelled to bury their strongest emotions beneath a veneer of indifferent camp bitchiness or hide them deeply away in the closet. In “The Lisbon Traviata”, McNally uses the love of opera and its emotional power to get at the feelings of his gay male characters with a maximum of intensity. It was written at a time (the 1980s) when it was commonplace to imagine that the emotional life of gay men was somehow shallower and less legitimate than their straight counterparts, even as the community was suffering the war-like impact of AIDs and its emotional attendants of terror and grief. Using opera as a model, the play pushes the inner life of its characters well beyond what is typically experienced outside of opera or classical tragedy. When Richard Thomas was appearing in the Los Angeles production, I read in an interview that he did not invite his children because he felt its depiction of gay characters might seem so grim and sad and close to stereotypical that he did not want them exposed to it until they were old enough to put it in context. I have similar reservations. I understand that, in the context of the 1980s, a strong case can be made for McNally’s approach. And I certainly recognize the excellence of the play’s construction, the elegance of the writing, and the power of its impact in performance. Still, a part of me (and I speak as a gay man who came out in the late 70s) finds it to be as excruciatingly dated and cringe-inducing as “The Boys In The Band”. These doubts notwithstanding, “The Lisbon Traviata” is a marvelous vehicle for fine if over-the-top acting, and the cast at New Conservatory Theatre Center delivers the goods. As the brilliant, brittle, bitchy yet bubbly Mendy, Michael Sally provokes laughter and tears with ease, handling the characters aria-like monologues with aplomb. Matt Weimer brings deep sadness to Mendy’s best friend (and unrequited love) Stephen, making his eventual operatically intense meltdown at the play’s denouement believable. 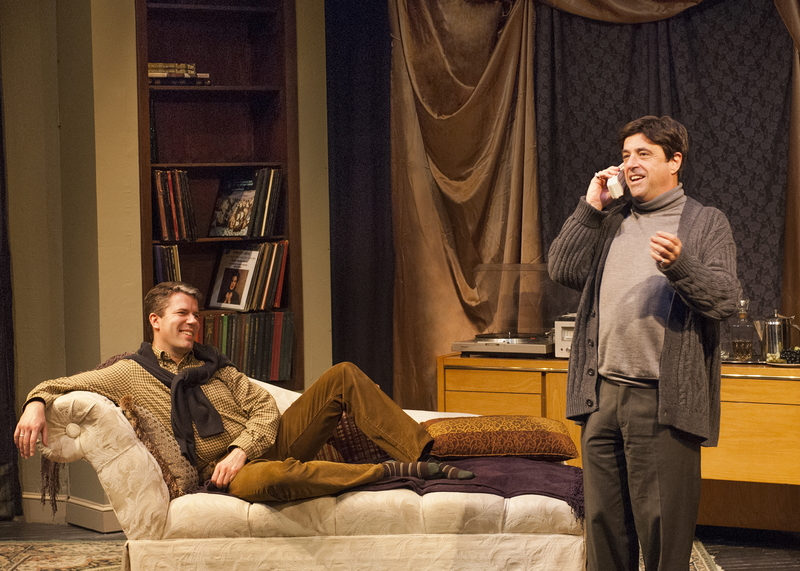 Philippe Gosselin and Adam Roy do well in the supporting roles of Stephen’s lover Mike and his new boyfriend. “The Lisbon Traviata” by Terrence McNally, produced by New Conservatory Theatre Center. Director: Dennis Lickteig. Set Design: Kuo-Hao Lo. Lighting Design: Christian Mejia. Sound Design: Stephen Abts. Costume Design: Jessie Amoroso. Fight Choreography: Will Springhorn. Stephen: Matt Weimer. Mendy: Michael Sally. Mike: Philippe Gosseline. Paul: Adam Roy. Posted in Reviews.Tagged Adam Roy, Charles Kruger, Dennis Lickteig, Matt Weimer, Michael Sally, New Conservatory Theatre Center, Philippe Gosseline, San Francisco Theatre Reviews, Terrence McNally, The Lisbon Traviata, theatrestorm.